NASA’s New Horizons probe has been exploring the farthest regions of our solar system and made a very special visit on New Year’s Day 2019.  On the first day of the new year, the probe buzzed an object unofficially called Ultima Thule, also known as Kuiper Belt object 2014 MU69. Sitting 4.1 billion miles (6.6 billion kilometers) from Earth, Ultima Thule is the most distant object ever explored by a spacecraft, and scientists believe it can provide information on the formation of the early solar system. 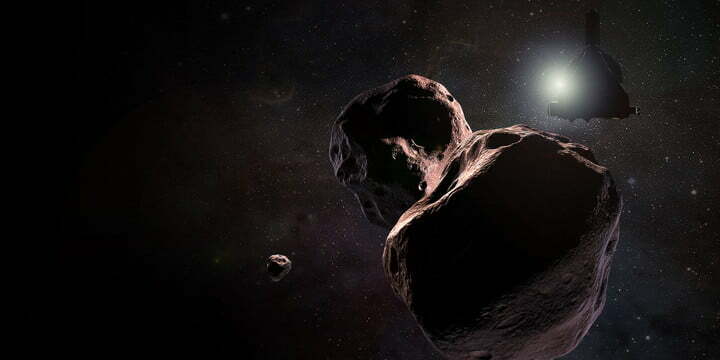 The probe passed Ultima Thule early in the morning on January 1, 2019. The Ultima Thule flyby happened live on the NASA TV YouTube channel. You can still watch the broadcast, which includes a briefing and panel discussion about the flyby and a stream of the signal acquisition from New Horizons. 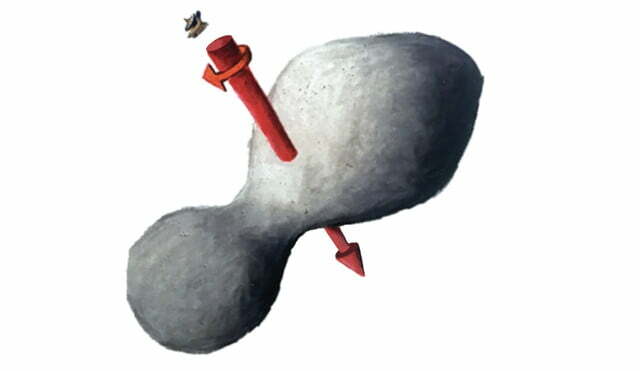 The Ultima Thule flyby was much more technically demanding than the flyby of Pluto due to the extra distance from Earth. There were many more unknowns involved, including the exact position of the object and the potential existence of nearby moons or other environmental hazards. In addition, there were lower levels of light and longer communication times in directing the probe, all of which added to the challenge. Now NASA has released the first color image of Ultima Thule, showing it to be a snowman shape — and also to have a reddish surface. On the far left is an image captured by the Multispectral Visible Imaging Camera (MVIC) which has been color enhanced to show to red shade of the surface, using a combination of near infrared, red, and blue channels. In the middle is a crisper image taken by the Long-Range Reconnaissance Imager (LORRI) which has better spatial resolution than the MVIC, allowing the capture of a more detailed but black and white image. On the right is an overlay of the two images, showing the approximate details and color of Ultima Thule. The image confirms that Ultima Thule is one non-spherical object, with the larger sphere called Ultima being 12 miles across and the smaller sphere called Thule being 9 miles across. So far there is no evidence of rings around the object or satellites larger than one mile wide orbiting it. The color is similar to other objects found in the Kuiper Belt like Pluto, and it is noteworthy that both “lobes” of the object are the same color. This indicates that the two lobes were once separate objects that joined together, not violently but at a gradual speed, somewhat like a spacecraft docking instead of a collision. This joining happened extremely early in the lifespan of the Solar System, with scientists estimating that the joining occurred in the first one percent of time between the Solar System forming and now. Previous images of Ultima Thule had suggested that it was bowling ball shaped, but with these new images several nerdy space fans have noted that the object bears a more striking resemblance to BB-8, the jolly round orange droid from the Star Wars movies. New Horizons principal investigator Alan Stern disagrees, however: “It’s a snowman, if it’s anything at all,” he told a press conference. There will be lots more data to come from the flyby which will gradually be sent back to Earth, but there will be a delay of a few weeks while the craft passes behind the Sun. You can see where the craft is currently located on the NASA website. Updated January 1, 2019 with information about the successful flyby. Updated January 5, 2019 with color images and further information about the object.